Despite the current property market slowdown, there are still investment opportunities on the subsale market, especially in Kuala Lumpur, that investors can ride on, said TheEdgeProperty.com director of business and product development Alvin Ong. “It is important to have an overview of Kuala Lumpur’s secondary market to see how prices are moving in the various areas and the different characteristics that these areas possess before investors can decide on where to place their bets. Of course, it also depends on how we expect the market to move,” he added. 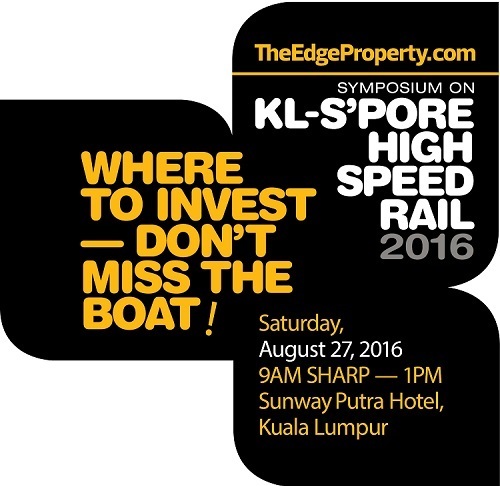 Alvin, who will be speaking at TheEdgeProperty.com’s “Symposium on Kuala Lumpur-Singapore High Speed Rail 2016” on Aug 27, will be highlighting areas such as Mont’Kiara, Cheras, Bukit Bintang, Taman Desa and KLCC and explaining how the property market in these areas has done well in general, in terms of capital appreciation and rental yields. He will also focus on how these areas have stayed resilient in the current market. “By the end of the talk, I hope the audience will be able to answer the following questions — which areas should I invest in if the market is going up, down or flat; what are some of the projects to consider if I am looking for capital gains or good rental yields; and what are some of the upcoming catalytic developments that will help boost capital appreciation and rental yields,” Alvin added. Meanwhile, Bukit Bintang City Centre (BBCC) Sdn Bhd CEO Datuk Richard Ong will give a presentation on the iconic development on the former Pudu Jail site. The 19.4-acre project with a gross development value (GDV) of RM8.7 billion is located at the intersection of Jalan Imbi and Jalan Pudu. It is being developed by a consortium comprising UDA Holdings Bhd, Eco World Development Group Bhd and the Employees Provident Fund in a 40:40:20 share structure over a period of between 8 and 10 years. “BBCC is well-poised to fulfil its role as a gateway to Kuala Lumpur because of its connectivity and accessibility. It is important to note that BBCC and the HSR have the potential to benefit from each other,” said Richard. He will also share information on BBCC’s master plan, which includes the integration of commercial, residential, retail and entertainment in one development. In addition, Richard will also be part of a panel discussion entitled “HSR: The Big Idea” to be held at the end of the symposium. The other panellists will be Ho Chin Soon Research chairman Ho Chin Soon and Savills Malaysia executive chairman Christopher Boyd. The session will be moderated by TheEdgeProperty.com managing director and editor-in-chief Au Foong Yee. Other real estate experts who will be featured at the symposium are KGV International Property Consultants executive director Samuel Tan and Henry Butcher Real Estate Sdn Bhd chief operating officer Tang Chee Meng.